How to add WaterMark to SfDataGrid while printing? SfDataGrid control allows you to print the data displayed in the DataGrid. You can refer here to know more about printing. You can show WaterMark in SfDataGrid while printing, with the help of PrintPageHeaderTemplate. You can display the WaterMark in various alignments by customizing the PrintPageHeaderTemplate. You can refer to the following code example to customize the PrintPageHeaderTemplate which shows PrintPageHeaderTemplate like WaterMark. By using rotate transformation, you can rotate the watermark text. Here, text is rotated at 45 degree. 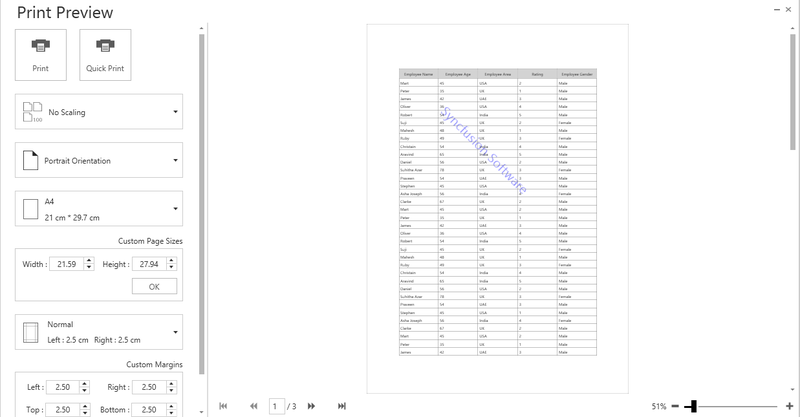 In the following code example, customized datatemplate is assigned to PrintPageHeaderTemplate. Note: When you are using the watermark, then the default header template cannot be customized in SfDataGrid. The following screenshot displays the watermark in SfDataGrid.